The Pinterest Reading Challenge this week is to read a book that was made into a movie. I have several books that were made into movies, anything from Harry Potter and The Hunger Games to Cloud Atlas and Pride and Prejudice. Actually, looking at my books shelves, it’s hard to find a book that hasn’t been made into a movie. They may not be good movies, nevertheless a movie. But I chose (for some strange reason) The Princess Bride. How on earth could I hate this movie?! I can’t help it, I’ve never been a fan of this movie. I’m not one for stupid comedy, and that’s exactly what The Princess Bride (both movie and book) is all about. I have many friends who are huge fans of The Princess Bride movie, and when we would have discussions about it, none of them could really explain to me why they loved it so much. It was always broken sentences, like, “The action… and Westley, what happens to Westley… Oh and the scene in the Fire Swamp!.. How could you not root for true love?” I’m sorry, but that told me nothing, but thanks for trying! Until one day my friend Lauren asked if I had read the book. Lauren is a huge fan of The Princess Bride. She and her boyfriend at the time would quote it, almost acting out the scenes for me to prove how wonderful it was (still wasn’t buying it, though I think they would have done much better jobs than the actors that were actually hired.) When she could tell that I still wasn’t impressed she asked me if I had read the book. I didn’t even know the book existed (this was in the very beginning of my library construction). “No,” I told her. “There’s a book?” “Go read the book, and then tell me if you still don’t like it. I think it’ll change your mind,” she responded. Years later, perusing the isles of Barnes & Noble, this bright green cover stood out to me. Not usually the color you find in the fantasy section which is usually all black, deep blues and purples. And there it was, The Princess Bride. And so, I bought it. I brought it home that day, and sat it on my book shelf (I was still reading something else at the time), and that’s where it sat. Three years and two moves later, this reading challenge came about and I decided it was time that I finally pick it up and really see what the hype is all about. I put this direct quote from Wikipedia in here because the edition I read was the 30th Anniversary Edition with multiple introductions and history on “S. Morgenstern,” and had I not done a little more research I would still be believing that S. Morgenstern was a real person, and that Goldman abridged his book, like Goldman says multiple times. So, don’t be confused, like me. Also, Florin is not a real country like you are led to believe while reading The Princess Bride. (I really feel like an idiot, because I really did think that it was one of those tiny countries that practically no one has ever heard of before.) Goldman in fact named both countries, Florin and Guilder, after ancient coins. I don’t know about you, but that synopsis makes me want to pick the book back up and I just finished it! Whomever wrote it did a great job with catching the potential reader’s attention. Bravo! And to be honest, reading this synopsis is a big reason why I did decide to buy the book three years ago. I was so against it at one point that if I hadn’t read this synopsis I know I wouldn’t have brought it home. Here is a book that has a little bit of almost every fairy tale imaginable in it. There is royalty, bandits and pirates. Kidnapping and sword fights. Far off places like The Cliffs of Insanity and the Fire Swamp, as well as concepts of horror such as the Zoo of Death and Count Rugen’s life-sucking Machine. There is magic and people dying to only come back from death. Its Disney princess movies meets Peter Pan meets Stephen King, but in a funny sort of way… if that makes any sense. As a whole, I did like The Princess Bride. While I still hate the movie, I think—now having read the book and re-watched the movie—that’s more because of some of the actors that were hired for the parts (a couple of the actors I just don’t like and I think they ruin just about anything they’re in because they annoy me that much.) I’m happy that I read the book and gave the story itself a second chance. When I first did my research, and found out that the whole book—history and introductions as well as the story—were all fiction, I was rather upset with the whole idea. I must admit, I’m not one that likes practical jokes, especially when they’re played on me, and that’s exactly what Goldman did, and I fell for all of them. So, I’m a little bitter toward him in the respect that he got me, over and over. But after stepping away and taking some time to think and reflect on the whole thing I rather like it. Knowing that now, the story behind The Princess Bride makes even more sense, and it’s a story that I feel the movie was missing. I would recommend that the book be read to get the whole fictional story rather than watching the movie; it’s a different kind of experience. And when you do pick it up, make sure that you read all the introductions, because I almost skipped them when I saw how long and how many of them there were, and boy would that have been even more confusing! Love this book? Check out Buttercup’s Baby: S. Morgenstern’s Glorious Examination of Courage Matched Against the Death of the Heart by William Goldman. Oh, no wait! In true Goldman fashion, he’s just teasing you. In reality, Buttercup’s Baby hasn’t been finished yet. However, you can check out a sample chapter of it in the 30th Anniversary Edition of The Princess Bride. 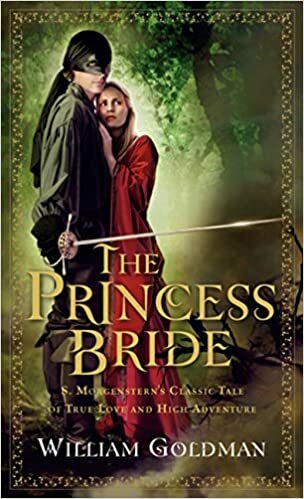 Goldman has also promised to have the full version completed before the 50th Anniversary Edition of The Princess Bride comes out in 2023, and I can’t wait, because I, too, am now addicted to the characters just like everyone else. Pair it with: Are you full or strength or a romantic who believes in true love? You might have to try both Inconceivable Cabernet and As You Wish Chardonnay to find out who’s right and who’s dead. Both wines are from the Bottle of Wits set in honor of The Princess Bride.